There’s Bad Poetry Day, there’s Toasted Marshmallow Day, there are several versions of Pancake Day, but no Kale Day. While discussing the October Unprocessed Challenge on Twitter a while back, the lack of Kale Day was noted – and remedied. Welcome to October 10, International Kale Day! What’s not to love? Kale is not only delicious, it’s one of the most nutritionally-dense foods available. It’s a detoxifier, blood builder, and digestive aid. I put it in eggs, smoothies, green juice, pasta, and rice dishes to name a few. Pictured here is red monarch kale, but I’ve used lacinato (also called dinosaur kale or cavolo nero), red Russian, and regular old curly kale. The curlier varieties may not “ribbon” as nicely, and that’s OK. But what to do about skeptics – Veggie-Hating Husbands, perhaps? Enter the potato. Sturdy, waxy Yukon Gold potatoes, to be precise. Kale is a toothsome green, and these aren’t fluffy clouds of potatoes. These are rib-sticking comfort potatoes, perfect for a cloudy day. I made them for Thanksgiving, and even my husband had seconds. Grab organic potatoes and you don’t even have to peel them. The protein and fiber are found in the skin, anyway. Inspired by Heidi Swanson, this is a simple recipe with few ingredients that all count. The result is a hearty-but-creamy dish that’s so delicious, no one will believe that it’s healthy. Did I mention it only takes about 20 minutes? Make a double-batch! They’d be great as a twice-baked casserole, pressed into patties and lightly fried with breadcrumbs, or plain old leftovers (that how I had mine for breakfast). Just make sure you share so you all have delicious garlic breath together. It’s worth it. Creamy Yukon Gold potatoes combine with garlic and olive oil to create a rich, vegan one-pot dish starring kale! 1.) Dice potatoes and place in lidded pot. Cover with cold water plus an inch. Add 1 teaspoon of salt and garlic cloves.2.) Bring to a boil, then simmer, partially covered, until potatoes are fork-tender, 10-15 minutes.3.) While potatoes are cooking, wash kale and remove stems. Stack leaves and roll into a cigar shape. Slice into ribbons. 4.) Drain potatoes (a little leftover water is actually good). Add olive oil and the last 1/2 teaspoon of salt. Mash to desired consistency. 5.) Stir in kale ribbons. Let stand for a few minutes to let the kale soften. Serve warm with a drizzle of olive oil and a sprinkle of coarse salt on top. Other nice toppings could be toasted bread crumbs or Parmesan cheese. Dude. I’m not even that much of a kale person, but this looks AMAZING. Why can’t you live next door to me? 😉 I am SO making these mashed potatoes, very soon. Bonus points: I just polished off the leftovers with a blob of wasabi mixed in. So good. Yes, but I’m quite positive that by the time I could get there, they’d be long gone with the bowl licked clean. 😉 Oooh, that sounds really good too! Good point. Next time, a double batch! Nice! 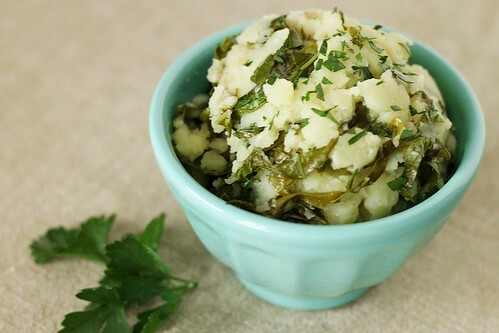 Mashed potatoes are often such gut-busters–what a GREAT idea to integrate kale into this! I finally made this today. All gotta say is – oh yum! I used the curly variety of kale so I sauteed it in olive oil first. Loved how simple, tasty and healthy this dish is. Husband totally loved it too!